The outside drivers door handle on my '72 convertible now pulls in and out without grabbing the mechanism behind it. The inside door handle works perfectly still. So to clarify it is not the physical handle that is broken, but it looks like I snapped a pin or something connecting the outside handle to the lock mechanism. 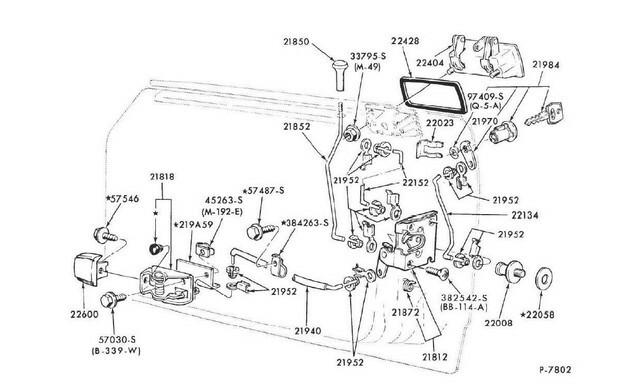 Does anyone have a part number, name or diagram of the area? There's a rod that goes from the handle to the door latch mechanism, held in my clips. Might be that the rod fell off on one end or the other. (03-21-2019, 04:09 PM)Hemikiller Wrote: There's a rod that goes from the handle to the door latch mechanism, held in my clips. Might be that the rod fell off on one end or the other. I have multiple spares of every actuator rod in the door. Let me know which one you need.